Dental crowns are often used to protect and restore damaged, root filled or decayed teeth to their former glory. They cover the entire outer surface of your prepared tooth and are sometimes referred to as caps. 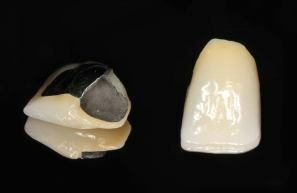 In addition to their protective function crowns may be used for cosmetic reasons to improve the appearance of a discoloured tooth or ones with large old fashioned fillings on show. 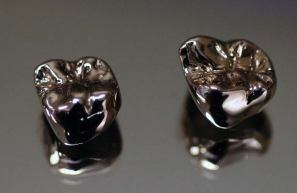 Metal crowns can be gold or silver coloured. These are made of metal alloys. They are very strong, and very rarely chip or break – you can choose between semi-precious and non-precious as you prefer – and they are usually placed on those teeth that are not visible. 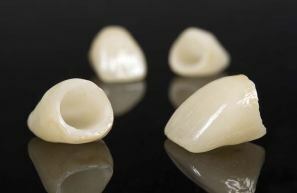 These describe a shell of metal that fits over the tooth which is then given a porcelain covering to provide a white tooth-like appearance. The porcelain can either cover the metal completely or just the outer visible part. The metal can be partially visible at times and they are more prone to chipping than the full metal and full ceramic equivalents. It is a choice we like to offer to keep every option available for different budgets. These look completely natural and indistinguishable from own teeth. They are less robust than their metal equivalents and tend to be used as a solution for front teeth that are on show.